I was in Cebu last week for a business trip. I brought my NET book with me but unfortunately it was newly formatted and our tech people forgot to install the Microsoft PowerPoint application on it. It was almost 12 midnight and I have to create a new PowerPoint presentation for our meeting in the morning. So how did I manage to complete the presentation? -- I created it online. 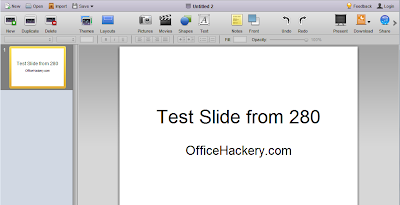 Yes you read it right, with the use of 280 slides, you can create PowerPoint presentations for free. 280 slides website is free online presentation editor. All functions are free to use and require not registration except for saving presentations. It supports presentations in Microsoft Power Point 2003, Microsoft Power Point 2007, Open Office or Adobe PDF format. If you don't want to register just create your new Presentation then click the download button as shown below.